It’s amazing to think that the Internet kept us busy for two decades or so just by delivering the ability to pass messsages between any two (or more) clients, and to consider all the things we’ve managed to achieve with this seemingly simple advance. It seems only yesterday I had one of the first private Internet connections in Australia (courtesy DIALix – the country’s first commercial ISP) and was able to communicate with others around the globe (in real-time courtesy [y]talk – responsiveness we still haven’t managed to faithfully replicate with today’s instant messaging networks!). But now it’s time to take the Internet to the next level. While the servers scaled up as the masses poured in it wasn’t long before we reached a glass ceiling – clearly vertical scalability wasn’t the way forward. Sure you can build big machines (after all, mainframes and minicomputers were fresh in our minds) but it’s like driving a boat – after a certain point you’ll use an order of magnitude more fuel to go only a fraction faster (think of the cost of big iron vs commodity white boxes). By now I was a university sysadmin and the dot-com bust was still a few years away. Officially I was busy setting up Aurema’s Share II (since acquired by Citrix) on a pair of SGI Origin servers so as UNSW’s Maths Department and the Australian Graduate School of Management (AGSM) could “fair share” the hardware they’d purchased together. Unofficially I was experimenting with making ~150 overpowered but under-used Pentium-II workstations appear as one (using Debian GNU/Linux, bpbatch aka Rembo aka IBM Tivoli and tools like PVM). I knew which approach I preferred but unfortunately the machines lived out their lives idling as X terminals and I went to work on dot-coms and the Sydney 2000 Olympics. Enter Google, Amazon and others (e.g. the entire grid community) who worked out how to make horizontal scalability work properly with toys like BigTable (A Distributed Storage System for Structured Data) and MapReduce (Simplified Data Processing on Large Clusters). It was finally possible to build services that could scale endlessly, allowing these pioneers to innovate without looking over their shoulders after becoming victims of their own success. We know how that worked out for them (after all the world only needs five computers, right?) – today we have computing powerhouses sprinkled around the Internet run by companies like Google and Amazon while everyone else is playing musical chairs and hoping they won’t wind up without a seat. To use the electricity grid analogy, the Internet is like the grid itself – that is, the network of wires and power stations that connect everything together. One can poke electrons in one side and know ekectrons will pop out the other, even if various links are severed. Indeed that’s all we’ve needed for email, instant messaging, media streaming and of course the web itself. The problem is that a grid without power stations isn’t so interesting. Useful, yes, but certainly not exploiting the technology to the fullest extent possible. 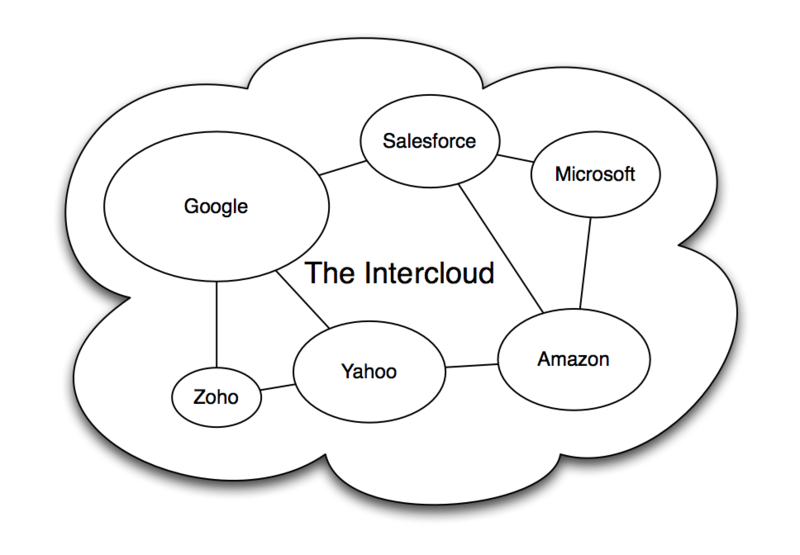 Enter cloud computing with various cloud providers (and the underlying Internet) forming the Intercloud. Cisco have been busy popularising the term lately, presenting a “blueprint” and whipping up A Hitchhiker’s Guide to the Inter-Cloud that unsurprisingly focuses on private cloud and finds a place for their Unified Computing System. Gartner have been getting in on the action too and it seems likely that before long a bunch of other people will as well. Although I think it’s got a snowflake’s chance in hell of displacing the Internet moniker, it may be useful for framing discussions about cloud computing interoperability and unlike many of the other terms that have popped up may actually serve some purpose (surely IBM of all people should know that whenever someone says “CloudBurst” $GOD kills a kitten). If we’re to realise the full value of cloud computing it will be by loosely coupled “aggregation” (as distinct from integration) of various offerings rather than putting all our eggs in one basket with a single provider. We don’t expect Microsoft to provide the best software for every task (hence products like Adobe Photoshop and Autodesk’s AutoCAD) so why expect less heterogeneity in the cloud?